GlobalCustodian.com is the website of Global Custodian, the leading magazine covering the international securities services business. Published five times a year by Tungsten Publishing, Global Custodian provides analysis and commentary on the latest news and events taking place in the international securities industry. 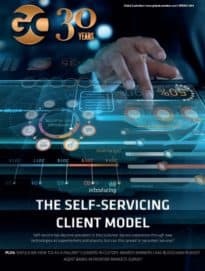 The magazine, with a circulation of 20,000 investment professionals around the world, is defined by high-quality editorial and a series of annual surveys that have become benchmarks for the industry. Founded in 1989, the original focus of the magazine was on securities processing operations: articles that explore how shares trade and settle and are held. Its editorial scope has since expanded to include fund administration, securities lending and financing, prime brokerage and the infrastructure of the global securities industry (CSDs, ICSDs, payments systems and other industry bodies and initiatives). The editorial content of the magazine is now also supported by industry-standard surveys that address how the performance of custodian banks, fund administrators, prime brokers and tri-party securities financing providers compare with each other and within individual markets. Global Custodian and GlobalCustodian.com are focused distribution vehicles for advertisers and sponsors wishing to reach and influence key decision-makers in the custody, fund administration, central securities depositary, hedge fund, prime brokerage, repo, securities lending, securities financing and collateral management industries. International securities trading and investment has grown rapidly in recent years, creating a worldwide community of interest between institutional investors, investment bankers, broker-dealers and custodian bankers, which Global Custodian alone exists to serve. The magazine and web site contain an unrivaled combination of quality editorial and original survey-based data, which affect the day-to-day decisions of industry players. GlobalCustodian.com aims to publish strictly relevant news stories in each of the areas covered in the magazine: custody, fund administration, market infrastructure (CSDs, CCPs and global STP solutions), securities lending and financing, prime brokerage and securities industry technology and to link them to magazine archive of articles and surveys. GlobalCustodian.com aims to add value to the news, and give leading industry figures a chance to influence the debate about key issues and developments, by providing regular commentary by the members of panels of experts in each of the five areas covered by magazine and the site. In serving industry players, both Global Custodian magazine and GlobalCustodian.com aspire to the highest standards in editorial integrity, surveys, research, and production values.